1. At 6 foot, 4 inches, Abraham Lincoln was the tallest president. 2. Lincoln was the first president to be born outside of the original thirteen colonies. 3. Lincoln was the first president to be photographed at his inauguration. John Wilkes Booth (his assassin) can be seen standing close to Lincoln in the picture. 4. There are no direct descendents of Abraham Lincoln even though he had 4 sons. 5. During the Civil War, telegraph wires were strung to follow the action on the battlefield. But there was no telegraph office in the White House, so Lincoln went across the street to the War Department to get the news. watch fob without a watch, a new silk-lined, leather wallet containing a pencil, a Confederate five-dollar bill, and news clippings of unrest in the Confederate Army, emancipation in Missouri, the Union party platform of 1864, and an article on the presidency by John Bright. 7. Lincoln was the only president to receive a patent, for a device for lifting boats over shoals. 8. Lincoln’s son, Robert, who was in Washington when his father was killed, was also on the scene when President Garfield was shot in 1881, and when President McKinley was assassinated in 1901. 9. Lincoln and his wife held séances in the White House. They had a great interest in psychic phenomena. 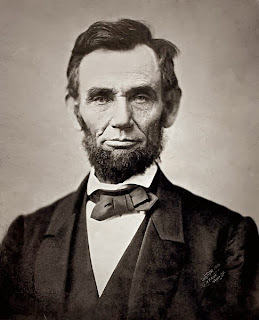 10.Lincoln was the first president to wear a beard. 11. Lincoln had the largest shoe-size documented. He wore a size 14! 12. Before Abraham Lincoln was elected president, he served in the Illinois legislature and practiced law in Springfield. Abraham Lincoln is buried in Springfield at Lincoln Tomb State Historic Site. 13. 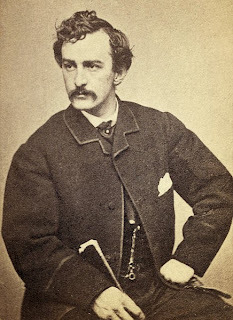 Lincoln was seeing the play "Our American Cousin" when he was shot. 14. A plot was developed to steal Lincoln's body, so a secret society to guard his tomb was formed. 15. Lincoln had a cat named "Bob," a turkey named "Jack," and a dog named "Jib."